subcontractor you will ever need. 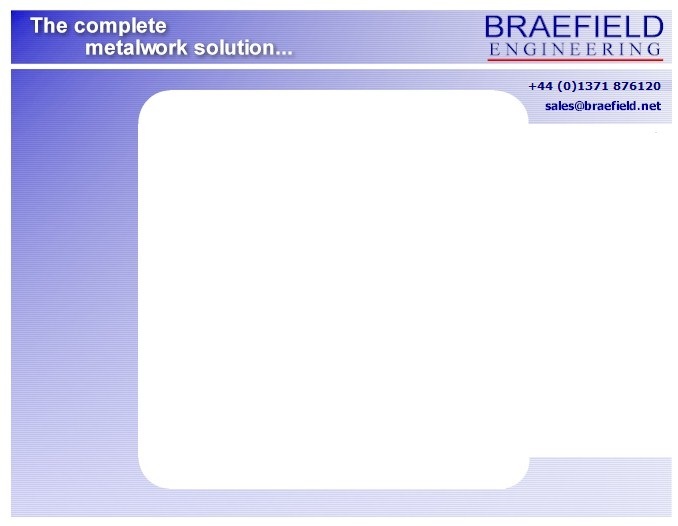 Braefield Engineering has been providing complete metalwork design and manufacturing solutions for over 45 years. We possess an enviable reputation for providing a fast, efficient and high quality standard of service. Conveniently located near to Stansted Airport with rapid transport links to London, the Home Counties, the East of England and beyond, our recently refurbished facility houses several advanced and fully equipped CNC centres managed by 30 highly experienced engineers. Using our decades of experience in metalwork we provide our customers with a complete project management service. We are one of a handful of companies that can provide both precision engineering and sheet metalwork in-house, as well as providing several additional services including CAD. So whether you are in need of machined parts, fine limit sheet metalwork or welded assemblies, we are equipped to take your ideas from the page to the prototype and manufacture small to large runs quickly and to the highest standard.